A conversation in the Fog Island Tavern: Abbé Boulah and Bog-Hubert discussing answers to the UN Secretary General’s Call for ‘Revolutionary thinking and action to ensure an economic model for survival’ at the World Economic Forum 2011. Another evening to forget about in the Fog Island Tavern, eh, Abbé Boulah? Ah, Bog-Hubert, good to see you — I’ve been waiting for you. An evening to forget about? Well, it depends. On whatever we’re going to make of it, of course. Oh? You’ve got some devious plans? Devious, as in interesting excitement? No, sorry to disappoint you. But there are always possibilities, don’t you think? Well, my friend, I did hear your sigh just when I came in. So that was about something other than another wasted evening? To waste entire evenings with useless small talk with? Like tonight, eh? Alright, so what’s the trouble with your online discussion? We’ve got some time; I don’t see any better temptations around. Come on, tell me. Revolutionary thinking and action? — and that from the UN Secretary General himself? Isn’t that like a captain on the high seas calling for a mutiny? You could look at it that way, sure. At any rate, it seems to indicate that there are some serious problems ahead, that are recognized even by the UN and that illustrious assembly in Davos. Are you saying that he — Ban Ki-Moon — thinks that those people in Davos are the ones who will come up with the needed revolutionary ideas — the very ones that caused our economic problems? I don’t think he said it quite that way. He put it more diplomatically: “We… have been exploiting resources …” and so on. And he probably used the opportunity to get his message out to a larger audience. Sure, isn’t that what he’s getting paid for? To promote the evolution of the UN to a world government? And isn’t that too one of the problems? Well, isn’t the UN itself a strange beast made up of questionable and obsolete entities — nations? Fossils, with their territorial interests, their power structures, their proven record of violent conflict resolution, their crazy decision-making methods, their corruption and their consistent tendencies to exploit not only other peoples but even their own citizens? And, as many people suspect, the UN desire to evolve into a world government of sorts, the ultimate superpower? Calm down already — I am perfectly aware of the flaws and misdeeds of nations. But isn’t the institution of the UN itself a feeble sign of reason, of some insight that we, humanity as a whole, have to at least talk about the nonviolent resolution of all our differences and problems? Do you see another possibility for that, than a forum like the UN? Bad ones too? You mean those damn terrorists? Those too, but the international finance system, the big corporations as well: aren’t they already operating pretty much outside of the little boxes of national rules and regulations? Not even to speak of international crime, the drug cartels, modern slave trade. Not necessarily very appealing models of future world order, but in themselves successful examples of global organizations not based on nations and their territories. Gee, I wonder why? Its meetings are coinciding with the Davos forum — which soaks up all the flashy media interest. Right. The media themselves are an example of global organization. Just like religions, which are essentially focused on universal acceptance — in spite of the old compromise with the state, the ‘cuius regio, eius religio’ maxim. There are many other such interest groups with global focus. But most of them obediently arrange themselves within existing national structures, and as a result suffer from the same structural conditions as those structures. Quite a pessimistic analysis, I see you frowning. Okay, I don’t want to start arguing about it for now. So what conclusions do you draw from it? Well. Let me think. The first thing would be to examine those structural conditions — that apply to nations as well as large corporations –, to put them on the list of problems or challenges to survival, put them on the agenda for discussion and revolutionary thought. I am all for taking action. But revolutionary action has all too often been associated with a certain lack of thought — just replacing one power group with another, without really changing those conditions. Remind me: what conditions did you have in mind? I can’t argue with that; we have talked about those issues before. And the first step would have to be to talk about them. More specifically, talk on a global level, right? But in what kind of forum? On whose agenda should those issues be dealt with? And how do we get them on that agenda, who is listening to us? So you got mixed up in that crowd? System Thinkers? Aren’t those precisely the people who have helped governments and corporations make their dubious machinations more efficient? Sounds like putting the fox in charge of the hen house? My impression is that there aren’t that many of those people in this particular group. Of course there are such people. But in this group there are many participants who argue forcefully against the use of system models for just profit and market share and dominance purposes — come to think of it, maybe that’s why there aren’t that many ‘real’ systems professionals — I mean people who are working for governments and corporations — among the contributors. The people in the group are discussing the problems from the systems thinking point of view that all components of the system of human society and environment are connected and influencing each other. They therefore see the systems tools such as mathematical models and simulations as tools that can also be used for the common good. Ah. The common good. How is that defined, by whom? These people — except some who seem to participate more from a perspective of criticism and suspicion of the entire scientific / systems view and would like to see a moral / ethical re-awakening first — seem to believe that these tools can serve to gain a better understanding of the behavior of systems such as the ecological systems of which society is a part, and then bring this understanding to the attention of a wider public so as to nudge people’s behavior into the direction of sustainability, coexistence with natural environment rather than dominance, nonviolent conflict resolution and cooperation, and so on. Sounds beautiful. Did something useful come out of all that discussion? Or what was the reason for the pitiful sigh I heard very clearly when I came in to disturb your systems thinking? What came of it? Well, let’s start with the positive results. The participants in that discussion researched — googled, I guess — an incredible number of ideas, experiments, projects and approaches to new practices and behaviors, that can be seen as small scale answers to the UN Secretary’s challenge. I have always been interested in these issues, have always been distrustful of the growth mania of the economy, of the logical flaws of modern democracies, of the influence of corporations and financial institutions on governments, of the manner in which the so-called blessings of technology, globalization, agribusiness are foisted upon developing countries. I saw myself as reasonably well informed about alternative approaches and ideas,but I confess I was hugely surprised at the number of such ideas and projects that are already out there. Well, just look at the number of links and references in that thread. Somewhere halfway through the discussion, the moderator Helene Finidori compiled a summary of all these links and ideas — she put that on a different platform  because of the limitations of the Linked-In forum — mainly the allowable length of posts. But the contributions and links kept pouring in. I don’t know whether she is still working on including all those in her summary or has given up, buried under the avalanche of links. It may be more useful to set up a list of topics that were touched upon in the discussion, to identify the main concerns of discussion contributions — as well as the topics that were not so well covered — in that list. Do you have such a list handy? Well, there is a list of topics in a kind of working IBIS  that already has about 80 topics. Good question. It’s quite simple: a topic is a general subject any participant brings up in the discussion; as a problem, question, an answer, and argument or argument premise, which gets picked up and debated by others. Of course they are not equally important, and some were raised precisely as reminders to start thinking about issues that had been neglected in the discussion. I can give you a short overview of the most important ones, as judged by my impression of the number of posts contributed to them — but I didn’t even count them so it’s a very unscientific perspective. A large number of contributions had to do with agriculture and gardening.The basic problem of provision of food and water for survival, that is claimed to be endangered precisely by the big agribusiness corporations. Most contributions urged a move away from the practices of large agribusiness corporations, away from their monocultures, their dependence of chemical fertilizers, their genetically modified crops and their destruction of small family-owned farms. Instead, they argued for more sustainable forms of agriculture: ‘permaculture’, preserving diversity of species, small family or community farms. But also reintroduction of food production in the cities: rooftop gardens, community gardens, and the principle of reducing the distance food products have to be transported from farm to consumer, by adjusting food consumption to available crops grown nearby. Right; there was a lot of loud and sustained sentiment against those. Talking about sustainability in general, there were of course a lot of posts about other aspects of sustainability, especially regarding energy. Moving away from fossil and nuclear fuels and towards wind, solar, and geothermal, in part again favoring small production plants, even family size, rather than large plants and networks. This especially in rural developing areas. Here too, there was an abundance of innovative experiments, some already in use, others almost ready to go. Anything from the corporations, government and industry, the main audience in Davos? Good question. There were reports about efficiency improvement programs in those camps, to reduce their CO2 footprints, to streamline their operation and production toward using less energy, resources and labor — naturally, in order to become more competitive. And this is where the contributions of system technicians and the use of mathematical optimization and simulation models was most noticeable. But many of the systems specialists in the group were suggesting that these tools could be applied to new approaches and ideas as well, for example to identify the ‘leverage points’ in the overall economic and ecological systems: the points where targeted action might most easily be applied to achieve meaningful changes. Were there some good examples of such models from the corporate or government perspective? Not really: As I said before, there were few systems guys from corporations and governments in that group. It may have something to do with the purpose of such models for corporations: to make the firm more competitive (among other things) and the corporations therefore are not eager to share them with potential competitors. Now there were a number of participants who were rather critical about these efforts, mainly from a point of view that these tools were things that had to be applied ‘top-down’ fashion and therefore remaining under the control of the big players and serving primarily their interests. They argued that real change could only be achieved ‘bottom-up’ on the basis of a new awareness and a radical re-awakening and renewal of a moral and ethical conscience of humanity. New values, a new relationship between society and nature. Specifically, as a pre-condition for actual initiatives — it seemed that some of these participants didn’t even want to begin thinking about and discussing actual proposals and actions before such a re-orientation had taken hold. It seemed that this was based on an assumption that real changes of behaviors, real solutions would then ‘emerge’ automatically, as a consequence of individuals’ new attitude and values. Right, they might argue that even any ‘solutions’ thought up by this group of inspired system thinkers would be seen as not really ‘theirs’, as something again foisted upon them by someone else. You’ve got a point there. In fact, some people were actually mentioning this ‘NIH’ attitude of resistance against anything ‘Not Invented Here’. But somebody has to start talking about different possibilities as a take-off point for the attitude adjustment, don’t you think? Of course there were some who thought that even with serious efforts to induce new awareness and ethics, what it would really take to get people to change would be a real crisis or disaster. 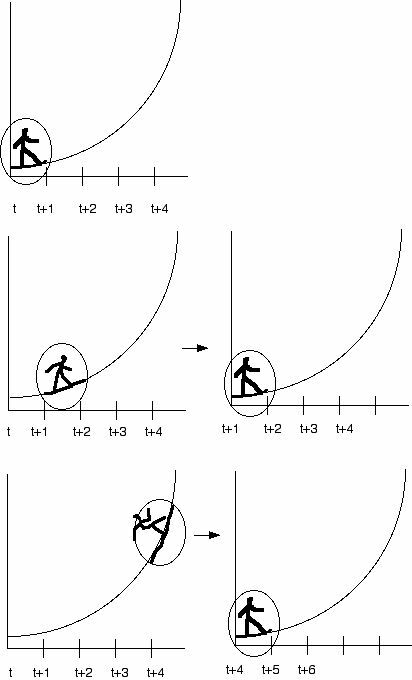 Anyway — there was a systems theory basis for this position: the idea of the ‘tipping point’: the notion that massive societal changes only occur once about ten percent of the people have accepted the respective ideas and attitudes: at that point, the rest of the population will be carried along, drawn into the movement at a rapid rate. Including, I guess, the folks and institutions who have been responsible for bringing about the problems in the first place. Therefore, according to the strategy, it is necessary to first focus on ‘spreading the word’ — about the problems and shortcomings and crimes of the current behaviors and the need for a new moral awareness — until the tipping point is reached. My, my. Haven’t the philosophers and the religions tried their best to change the moral makeup of humanity for thousands of years already — so how come we are still in this mess? We have to keep trying, don’t we? Even though already the ancient Greeks had a mythical poster child for such efforts..
You mean ol’ Sisyphus? Ah well. But another question: What if there are several such movements, — perhaps somewhat incompatible — that each reach their tipping point? There could be ten of those ten percent competing tipping points, if my math is still up to coping with these challenges, and then what will happen? But I’m sorry, you weren’t finished with your overview, were you? Well, those were pretty much the main themes. Of course there were demands for better regulation of the financial systems; to revise the habits of governments in view of their economic policies; to get a handle on corruption, to fight social inequality — which seems to have gotten so much worse in recent times even in the western so-called democracies — to have governments adjust their policies according to the well-being of citizens rather than Gross National Product or economic growth. To start using new measures of citizens’ quality of life. But here, there were few specific proposals and ideas. As far as I could see, — I think I mentioned that already — there were few if any real politicians or economic and financing experts in the group. So many posts about these themes amounted to little more than wishful thinking or the usual grumbling about the government, the problems, and the usual evildoers. Well, that all sounds like a lot of good intentions, but nothing really new and revolutionary. And you said many of the specific initiatives and ideas are already being implemented in various places? So that giant discussion didn’t really result in any revolutionary thoughts? As is ‘not having been thought of before’ to turn things around? Ah, I see: the problems you mentioned earlier, the things to put on the agenda: the questions about the nation-based social order of the global society, whether the forms of governance are up to the challenges we are seeing — or even causing the problems — whether we need alternative forms of governance and what those would look like; the problem of control of power in government and private enterprise, the problem of better sanctions for non-compliance with laws and treaties and agreements, and the need for better decision-making rules for governance entities to replace voting; if I remember correctly: All that was not discussed? Sorry, only marginally. Though I may not have caught all the material that was linked. There were some suggestions, a few are listed in the IBIS I mentioned. But not much discussion. It seemed as if ideas that didn’t come with an url, a link to a web site or other documentation, that were actually produced by participants in the discussion ‘on the spot’ were so unexpected that they weren’t taken seriously. As if creative ideas sparked by the discussion itself were seen as so undeveloped and unqualified, that they couldn’t even be discussed as ‘revolutionary’ ideas. Ideas which arguably, in my book, means ideas that have n o t already been published and reviewed by the accepted gatekeepers of opinion. It seems that your systems thinkers, at least those in that discussion, were not a particularly original and creative crowd? Well, at least they seemed more interested in googling other people’s ideas: yes, that is my impression. And yes, somewhat disappointing. One kind of justification that was hinted at was that we first had to ‘understand the system’ before we should begin to tinker with it and make revolutionary noises. The revolutionary a c t i o n aspect, by the way, was almost unanimously rejected in favor of a more evolutionary approach. I suspect your disappointment has something to do with the fact that some of those undocumented, un-urled ideas were some of our favorite issues and proposals, eh? Touché. Yes, there were some of the ideas we have been talking about and put out for discussion. But then there was the proposal by some participants to pull together some kind of summary report for presenting to the UN or some other entity, from the material assembled in the discussion. That looked like a good opportunity to bring those ideas of ours into a larger concrete perspective. But I guess the notion of pulling all that together into a coherent strategy proposal for organizations like the UN was a bit over-ambitious. Coherent strategy: sounds ambitious all right. But now you’ve made me curious, spill the beans! What in the world would you — based on all that material — put on the agenda of the UN to deal with the challenges of the Secretary General? Or of any other agency, if the UN isn’t the one to do that? Wait. Slow down a bit. You are right in that the reservations many people have about the UN or any other global government should be taken seriously. For the UN, it’s not only because it’s seen as such a would-be world government, — (and I suspect that many people in the U.S. are merely worried about the U.S. losing its de facto status as a world superpower), but because it’s composed of nations, and because it has not even begun to sincerely discuss let alone solve the problems of its decision methods (voting) and control of power and corruption. So all of that is up for discussion; but for the time being, it looks as if the UN is just about the only plausible mechanism we have to get the discussion started and organized, for example with the so-called UN Global Compact the Secretary General mentioned in his speech. A mechanism that is supposed to question its own legitimacy and existence? That would be a hard one to swallow for many people. Well, it doesn’t have to be on the top of the agenda. But it should be somewhere on there, don’t you think? I’d have to think about that. Meanwhile: what else do you see on the agenda? You might get an overview in this diagram — a proposed framework for the overall project, with several major components. It integrates both the ‘top-down’ and the ‘bottom-up’ functions. I see. Why are the bottom-up functions on the top of the diagram? To emphasize the importance of the ‘top’ and ‘bottom’ in relation to each other. So the many small projects — ‘Action projects’, the mostly local, still small scale initiatives by people trying out something new: those are seen as the most important source of innovation and energy towards the needed transformation. Even if they follow different principles and do not conform to one consistent overall plan. Those initiatives should be encouraged and supported. We need the diversity of these experiments — if for no other reason than to find out what works and what doesn’t work. I can think of some other reasons — but do go on with your explanation. For example, are you saying that all such projects should be supported, indiscriminately? With whose funds? I’m not sure you are understanding these projects right. Many if not most of them are run by people who want to realize and demonstrate their independence from traditional structures of power, organization, administration — their own empowerment. So it’s not always about funding, but more about enabling, removing bureaucratic obstacles; about recognition and encouragement; and information-sharing about similar projects. But I do think a shift of ‘top-down’ funding from large projects towards small local initiatives would be useful. If you are asking me about setting priorities among such projects, I’d say we should favor projects that don’t just focus on one single aspect or objective but try to pursue several aims simultaneously. Well, a rather modest example is the ‘Cart-mart’ idea we have discussed, if I remember correctly. To help revitalize downtown areas that have become monoculture office districts and in the process have driven out both residents and the small scale shops and businesses that supported them — so that these areas are deserted — and dangerous — after business hours. And all the people working there but have moved to the suburbs have to commute there, increasing traffic, but mostly individual automobile traffic since the suburbs are too low-density to support efficient and affordable mass transit; using fossil fuels, creating pollution, noise, traffic jams. So many cities are desperately trying to reverse that process — but having trouble doing so because economics and regulations are making it too difficult for ‘regular’ small shops. That doesn’t surprise me — they are not attacking the problem where it matters — with the regulations about what uses should be allowed at the sidewalk level, for example. Right. The Cart-mart idea could help initiate a transition process. Instead of regular shops, assemble a fleet of small carts or vans into a kind of bazaar, say, on an empty lot or on the ground floor of a larger building; provide common support facilities. The carts offer daytime-specific wares, and things that attract a high frequency of visitors — tax them inversely to their visitor-per square-foot-hour — but only for several hours at a time. The same space is used by several carts throughout the day. Opportunities for part-time, independent businesses. Local universities can run experimental businesses, support graduate students with part-time employment in actually running a business. These vans could begin selling locally grown produce; others could be supported by ‘Big Box’ stores outside the inner city. ‘Full time’ vans might travel to the suburbs and set up ‘instant markets for a few hours at a time to serve residents there — people who can’t drive, or who now don’t need to drive to the nearest supermarket for small purchases — which helps traffic and neighborhood cohesion — people having an opportunity to meet and chat. So the scheme serves several purposes at the same time. Another project that came up in the discussion was the ‘OASIS’ project. It’s a proposal to use the fact that the oil tankers transporting oil from arid and desert places to the refineries in industrialized regions need ballast for the return trip. Instead of ocean or river water, the proposal is to use partially treated wastewater — ‘grey water’ — from those areas, and deliver it to desert areas to restore vegetation there: forests, agriculture. This reduces the wastewater problem in the industrialized places — water that is usually quite expensive to treat, and / or damaging to the rivers and waterways where they are often released. It reduces the problem of the release of the ballast water in the oil countries — introducing pollution and foreign species into those water. It helps restoring forests and agriculture in desert areas — not only developing food and forestry good production, but also, and perhaps even more importantly, improving the climate in those areas, increasing rainfall and absorbing CO2. Multiple benefits — get the idea? Yes. In fact, it reminds me of the proposal somebody made some time ago — weren’t you involved in that one? — to grow crops on all the highway medians and right-of-ways that could be used to make biofuel and also could be irrigated with grey water. Using the highway maintenance equipment that’s already there to grow, cut and dispose of the useless grass they usually grow there. And reduce the pressure to use food crops for biofuel production, which makes food more expensive… Getting several flies with one swatter there too. Right. Another, somewhat more involved example of such multi-purpose projects is the idea of encouraging the development of the kind of alternative innovation experiment projects we talked about a while ago, in areas that have been destroyed or damaged by natural of man-made disasters.They need — and usually get — considerable funding for reconstruction which is not always done in a very orderly and effective manner, — and if just restoring the previous state of affairs just provides fodder for the next disaster. Instead, the fact that new infrastructure and organization in such areas does not have to compete with existing systems — that perceive and often resist new, alternative approaches as competition — should be seen as opportunities for new ways of organizing and running communities — the kind of experiments we said we need. If successful, these systems could then begin to spur and accelerate the transformation of adjacent, undamaged areas. And if unsuccessful, the current systems could gradually take over those projects again — but we have the information about those experiments. Well, I get the idea. Plenty of projects to support and to explore. But we got a little caught up in the details here — didn’t you want to explain your overall scheme first? Thanks for getting me back on track. Well, to make the most of all these initiatives and projects, I’d say we need a global Coordination service or component. To share information and experiences: there is a need for compiling all that information. It involves translation — not only between real languages, but also from discipline jargon to language a wider audience can understand and interact with, discuss. That is not a local task but work for a global organization such as the UN, if we don’t have anything better. Note that ‘coordination’ does not mean top-down management or direction according to some imposed overall scheme into some specific direction — always a danger even for the most well-intentioned initiatives — but simply to keep up with the various initiatives, monitor what’s going on, facilitate the sharing of information. You mean just documentation, reporting, information-networking? I get your drift. Of course there will be tasks and problems, even conflicts, which can’t be settled just on the local level but for which global agreements, treaties, contracts will be needed. Ah: top-down decisions, after all? You can’t tear yourself away from this kind of thinking, can you? No, these agreements can’t be decisions made by some global authority remote from local concerns of affected people. It looks like many of the problems within the EU and UN are related to the failure of these institutions to provide a workable connection between these concerns and the decision-making level. Or if there is that connection, to make that sufficiently clear to everybody. I agree, there is a distinct perception of a significant disconnect. Just some formal provision of ‘representation’ of different groups– nations – based on majority-based ‘elections’ organized along party lines doesn’t seem to overcome that perception. Right. So the problem will be to organize a workable global framework for bringing those concerns to the decision-making level. This means a dialogue, a discourse framework or forum. This might be best understood as a global ‘constitution’ for collective planning and policy-making. This too must be supported by a suitable information system — and in my opinion that systems should be based on the late Professor Rittel’s ideas for ‘issue based information systems’ (IBIS) and ‘argumentative planning information systems’ (APIS) . The argumentative model of planning, understanding it as a process in which opinions about proposed plans — not merely ‘facts’ — are brought in by the concerned parties. The opposing opinions are supported by answers and — essentially — arguments. Now, how is this different from the venerable parliamentary tradition — the principle of ‘let’s leave our weapons outside and discuss our differences, maybe work out a compromise we can all live with, and then decide’? That has been around for some time — but doesn’t seem to have really solved the problems? That does begin to sound somewhat revolutionary, though I’m not sure how easy it will be to implement, especially on a global scale. Yes, that is why the development of some globally organized forum or framework is such an important task. And that would properly be the responsibility of a global institution such as the UN. Let’s not forget another important task of that framework: just like the coordination component, the translation of all discussion contributions into all the other languages will be an absolute necessity to guarantee equal access and participation. And that includes the translation of disciplinary jargon into common language. Even in the discussion on the Systems Thinking forum, which was carried on in English only! — it became apparent that within the field of systems thinking, there are several different schools of thought, each with their own specialized vocabulary and acronyms, that made constructive communication difficult, even within that small group of people one might have assumed to be working from a common basis of understanding. Yes I can see that. So what kind of issues would these mammoth global discussions be about? What are the topics? That is an important question, one about which people will have very different attitudes. In principle, all proposals and agreements that cannot be settled on a purely local community level must be brought into a larger discourse forum. The rules for international air and sea traffic are examples of issues that must be settled on a global level. Some such rules might be trivial and the decision arbitrary: look at the rules for driving on public roads. There is no intrinsic reason that says driving on the right side of the road is more ‘correct’ or better than driving on the left. But there has to be an agreement about a common rule: Would you want to negotiate with every oncoming vehicle whether you are going to pass on this or that side, on the noble principle of anti-globalization and limited government? Good luck. Chaos. So such decisions have to be made on a large, even global scale. Well, I have seen my share of chaos even in strictly regulated right-hand-driving traffic… But how many such global rules do we need? There is a whole list of urgent problems that belong on such a global agenda. Problems for which we need not only workable agreements but even just better solutions and tools about which to decide. There are issues about the control of power, the development of better decision-making rules and criteria that we mentioned a while ago, the development of better means for ensuring that agreements and treaties and laws are adhered to and not broken — sanctions that don’t have to be ‘enforced’ by some entity (‘enforcement agency’) that is able to coerce people to comply through the application — or threat of application — of greater force than any potential violator. Simple: if adherence to agreements is achieved by the threat of applying greater force, how do you achieve adherence to agreements by that enforcement agency itself, since by definition there is no greater, stronger power? So as long as any powerful agency or individual can be tempted to break the rules, to abuse its power, the establishment of ‘biggest’, strongest enforcement powers is a very dangerous thing. Who will hold the strongest power to the laws? The traditional safeguards — time limits, re-election, balance of powers — are reaching the limit if their effectiveness, and at the level of global governance have not been successfully established yet. So the solution would have to be to develop sanctions that don’t have to be ‘enforced’ but that will be triggered automatically by the very attempt of violation, wouldn’t you say? I’m not sure that would take care of the entire problem of power, but I agree that it would reduce the excuses and extent of power agencies that can be abused. But I don’t see how it can be done: how would you do that? The principle is very simple — the model is the old Watts steam engine regulator: as the rotating weights rise with increasing speed, the lever on which they are attached closes the steam valve. Or the idea of the car ignition key that is connected to a breath alcohol sensor and simply won’t start the engine when the driver is inebriated. But I agree, simple as the idea is, the tools for application to the power control issue will require some R&D. 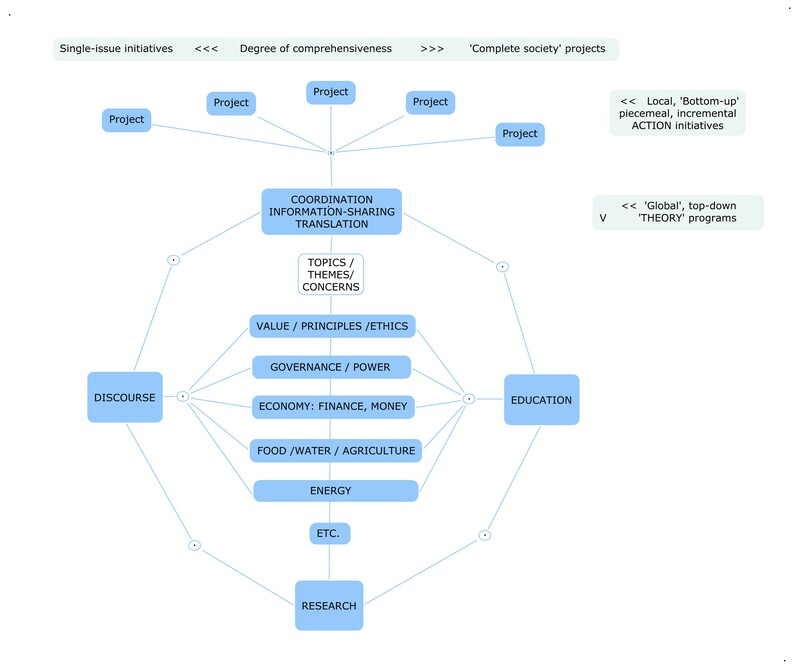 The point is that this task must be put on the agenda and given some priority in the research component of this overall framework that you can see in the diagram. There are many such issues that such a research program should investigate to support both the various experimental projects and the discourse, as well as the education component that we still have to talk about. I can see that this will take some effort of coordination and funding too. Just take the problem of ‘intellectual property’ and patents, given that research isn’t being done just in universities like in the good old days, but increasingly by private companies, industry, the military, agencies like NASA, think tanks, governments, — all with varying motivations and priorities driven by their funding. Right: the need to coordinate all that so that it can be meaningfully brought into the global discourse runs smack into problems like that of industrial espionage — the desire of industry to keep its most advanced research secret and hidden from potential competitors. Hammering out adequate global adequate agreements for this will be a considerable effort. But it is clear that for precisely those reasons, it can’t just be left to private enterprise, as some people are demanding, people who see government or other public agencies as the problem and not as the solution. Yes, this will not be a small and easy task. Will the arrangements for the education component in that diagram be any easier? Or are there already grand solutions for that problem? Sorry, no great ready-made solutions for that one either. But some basic guidelines and principles can be sketched out, at least as they concern the role of education in the overall framework here. Explain: what principles? I don’t think you can be talking about a grand scheme to revamp all the school systems in all the world’s countries? And that gordic knot is supposed to be hacked through within this project? Lots of luck. Hacked through? No, it’s not that ambitious. The problem is too big to be solved with some quick fixes. The idea is rather to introduce the aspects that have not been offered in the old curricula, step by step, using new media and technology. Take for example the discourse component with its supporting information system and argument evaluation approach: that is not in any syllabus of any traditional school system anywhere. If even logic is part of any general education program anymore, it does not include the study of the kind of arguments we always use in planning and policy-making discussions, — because those are not ‘valid’, from a formal logic point of view, like the good old syllogisms of Socrates and Aristotle — at best ‘inconclusive’, and thus disregarded by logicians. So that is an example of new content, content that is urgently needed, that should be prepared and offered with new tools within this overall framework. And what are those tools you are talking about? Internet, cellphones, video-games, for example. Cellphones are spreading fast even into the poorest countries and slums everywhere — and young people are catching on even faster than adults to their new possibilities. So things like the argumentative planning game that we are just trying to develop, could be used to introduce these new ideas and familiarize people with their use — via cellphones and internet. The key, I think, will be to link the game rewards to cooperative and meaningful contributions to the discussion. Players get basic points for making any contributions, on the one hand — points that can be modified by all participants’ assessment of their merit –importance and plausibility. But on the other hand, part of the reward is based on the overall plausibility and quality of the final plan solution they are working out and negotiating — in a win-win rather than win-lose pattern of most other games. But that is just one example; other possibilities would be to adapt system simulation models (that are developed in the research component), of ecological, social, economic systems, to achieve successful sustainable strategies, to such games and teaching tools. I understand: you think that if people get sufficiently familiar with the new approaches through games, they might begin to apply these approaches to real problems? And get them into the official planning institutions through the back door, as it were? Sneaky. And almost revolutionary, I agree. Do you think all this has a chance of being realized? Honestly, I don’t know. Though I see it as more evolutionary than revolutionary. Because, after all, these proposals don’t call for wholesale abolition and revolutionary change of existing structures, but are building on those — or I should say, aim at growing new solutions in the cracks and blind spots of traditional structures. Is that revolutionary? Only if one insists on leaving the current systems entirely untouched to muddle through as before. But even the WEF and UN people have understood that business as usual won’t work anymore. And with these proposals, one can begin to actually do meaningful things on a small scale, as well as grow a global framework to discuss overall agreements and solutions — a framework that does not lead to or require a big brother world government but aims at step-by-step minimal agreements that can open existing structures and transform traditional unsustainable practice to create opportunities for the creative development of many sustainable societal arrangements within an overall framework for peaceful and cooperative coexistence.do meaningful things on a small scale, as well as grow a global framework to discuss overall agreements and solutions — a framework that does not lead to or require a big brother world government but aims at step-by-step minimal agreements that can open existing structures and transform traditional unsustainable practice to create opportunities for the creative development of many sustainable societal arrangements within an overall framework for peaceful and cooperative coexistence. I agree that it’s a desirable vision, and yes, a necessary one — but a big task. Is humanity ready for such a project yet? Warning for global suicide and time running out, Ban Ki-Moon called last Friday at Davos for revolutionary thinking and action to ensure an economic model for survival. What is needed to take a global interconnected perspective on the issues and threats our planet is facing and start action? How can this gain traction and produce the desired effect? Summary H. Finidori: UN call for revolutionary thinking and action to ensure an economic model for survival… How to make this happen? The question below is an on-going discussion that started on the LinkedIn Systems Wiki Group in February 2011. After 1100 posts, we felt the need to start a summary to refine the discussion on particular issue and collaborate on some tools and models to help bring more sustainable practices to life. The various sections of the summary can be accessed through the link below. Do not hesitate to comment. If you wish to comment on the question itself in more general terms and participate in the discussion, please join us on the LinkedIn thread. Mann, Thorbjoern: Argument Assessment for Design Decisions, Dissertation, Department of Architecture, University of California, Berkeley, 1977. – “Some Limitations of the Argumentative Model of Design” in: Design Methods and Theories, Vol. 14, No. 1, 1980. Also published in Polish in the yearbook of the Department of Praxiology, Polish Academy of Sciences, Warsaw, Poland 1983. – “Procedural Building Blocks: The Interface Between Argumentative Discourse and Formal Evaluation Procedures in Design” Proceedings, Eighth European Conference. on Cybernetics and Systems, Vienna, 1986. – “Linking Argumentative Discourse with Formal Objectification Procedures” Chapter 8 in: Knowledge Based Systems for Multiple Environments, Cohort, Anderson, Bandler, eds. Ashgate, Gower,UK.1992. – “Application of the Argumentative Model of Design to an Issue of Local Government” Proceedings, Eleventh European Meeting on Cybernetics and Systems, Vienna 1994. – “Expert Systems for Design and Planning: Requirements and Expectations”, (Poster presentation) Proceedings, International Conference on Engineering Design, Prague, 1995. – “Development and Evolution of the Argumentative Model of Design” Presentation, Gesellschaft für Mathematik und DatenVerarbeitung, Bonn 1999. Kunz, W. und Horst Rittel: “Issues as Elements of Information Systems’ Working paper 131, Institute for Urban and Regional STudies, University of California, Berkeley 1970. – Rittel, H. and M. Webber (1974): “Dilemmas in a General Theory of Planning” in Policy Sciences 4, 1974. – Rittel, H. et al. (1972): Intensivere Nutzung der räumlichen Kapazität im Hochschul-bereich, Project for the German Bundesministeriums für Bildung und Wissenschaft, Bonn, Project report. Heidelberg: Studiengruppe für Systemforschung. – Rittel, H. (1972) “On the Planning Crisis: Systems Analysis of the ‘First and Second Generations’.” BedriftsØkonomen. #8, 1972. Draft paper: The Argument Evaluation Game. (unpubl. 2012) Available upon request: thormann@nettally.com.